« Pay Attention! Are You Listening to Me? The end of the school year is almost here, and for schooled kids, that means awards and certificates are about to be liberally handed out. We reward kids for everything these days! It’s one aspect of public schooling that new homeschool parents sometimes miss. We all want our kids to be happy, and we also want bragging rights since we live in a world along with non-homeschooled family and friends. The problem is that children quickly learn to expect more, and lose interest in doing things that won’t be rewarded. 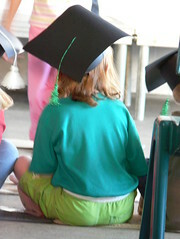 When a child completes preschool, kindergarten, 6th grade, and 8th grade, it’s not unusual to have a graduation ceremony, complete with diploma, cap, and gown. Not long ago, being promoted to the next grade was expected, and was no big deal. Maybe today’s schools think it will help the child endure school by offering this reward every few years. Certificates are given for just about anything in an effort to make sure every child gets acknowledged for something. Was the activity they participated in so dull to them that they need to be bribed with a certificate? And if it was a wonderful experience, shouldn’t their own personal achievement be reward enough? Do homeschoolers need awards and bribes? I get a few inquiries from homeschoolers every year who are interested in including rewards in their homeschool. While the decision rests with the parent, I respond with reasons why they might want to reconsider because I think these bribes get in the way of learning for the joy of it. When we homeschool, we have the option to choose a different path, one that might not leave our children depending on certificates (or even report cards) for validation of their worthiness. They will grow up doing what they do because they love it, not because they need recognition. I think it makes them stronger learners, and I also think it helps protect them from peer pressure by making them confident individuals who aren’t waiting for their reward from an outside source. There are times when a traditional reward might be appropriate, especially when a child is transitioning from the schools. You might be able to give it a homeschool twist by suggesting that the child help design it so that it would have special significance. Or a young child might like to be given some blank certificates to play with during their transition to homeschooling. If your child participates in an activity with other kids, you can pretty much expect that they will all be getting something, but you can keep it in perspective. Instead of all the attention being on that piece of paper (“Wow honey, look at that – it has your name! You are really special because you were part of this group. Let’s go to dinner to celebrate!”), perhaps comment on how much they helped the team, or just what a fun time was had by all. And finally, the BIG day! When your homeschooled child graduates from high school, that’s a great time to give them their first diploma. It’s a milestone worth celebrating! Written by Karen Taylor, posted on 23 April 2012 at 10:01 am, and filed under Homeschooling, Parenting. Bookmark the permalink.